From bestselling writers Gwenda Bond (Lois Lane: Fallout) and Kate Leth (Patsy Walker A.K.A. Hellcat), featuring stunning art by acclaimed artist Ming Doyle (The Kitchen, Constantine: The Hellblazer). The ghostly Harlequin has taken wire walker Jules's boyfriend, Remy, captive in his underground lair, but what does he want? 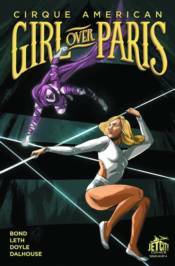 A dazzling acrobatic duel high above the streets of Paris will decide Remy's fate, as Jules pushes past her limits to best the supernatural skills of the ghostly Harlequin!